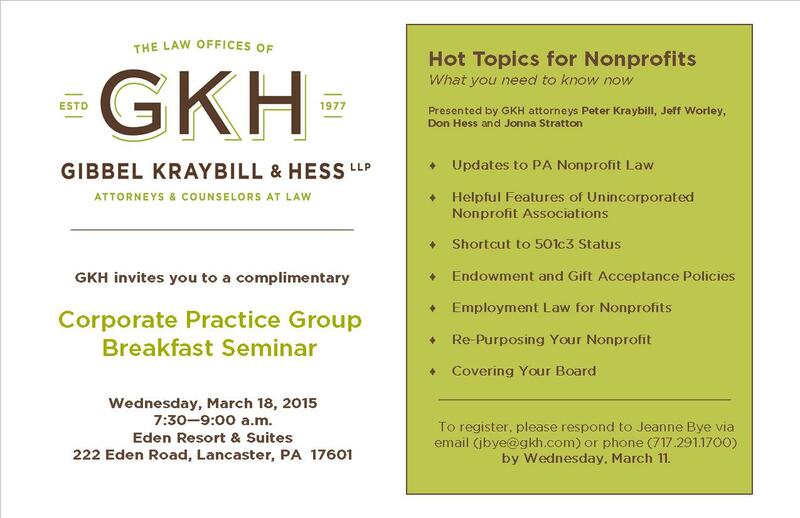 Clients of GKH are invited to a free seminar, “Hot Topics for Nonprofits,” on Wednesday, March 18, 2015, at Eden Resort and Suites. GKH corporate attorneys Peter Kraybill, Jeff Worley, Don Hess and Jonna Stratton will present must-have information for anyone involved with nonprofits. To view the invitation, including a list of topics, click here. A complimentary buffet breakfast is included. All GKH clients are welcome. To register, please contact Jeanne Bye via email or at 717.291.1700 by March 11, 2015.